Maharaja Suraj Mal (1707�1763) was ruler of Bharatpur in Rajasthan in India. He is known as "Plato" of Jat caste in India. He was born in the month of February 1707. He was one of the eighteen living sons of Thakur Badan Singh. Maharaja Suraj Mal created Raja Brajendra Bahadur, married 14 wives, including, (a) Maharani Kishori, (b) Rani Lakshmi, (c) Rani Hansia, (d) Rani Ganga, (e) Rani Kavaria, (f) Rani Khet Kumari. In the early 17th century, the peasant folk of Bharatpur were being terrorized and ill treated by the Mughals. At this point of time Churaman, a powerful Jat village headman rose against this tyranny but was defeated harshly by the Mughals. This did not remain for long, since the Jats once again came together under the leadership of Badan Singh, and controlled a vast expanse of territory. The Mughal emperor recognized him and the title of �Raja� (king) was conferred upon him in 1724. Deeg was the first capital of the Bharatpur state with Badan Singh being proclaimed its ruler in 1722. He was responsible for conceiving and constructing the royal palace on the southern side of the garden, now called Purana Mahal or old palace. Because of its strategic location and proximity to Mathura and Agra, Deeg was vulnerable to repeated attacks by invaders. In 1730, crown prince Suraj Mal is reported to have erected the strong fortress with towering walls and a deepwater moat with high ramparts about 20 feet wide in the southern portion of the town. In the same year he built the fortress at Kumher. Raja Badan Singh�s heir, Raja Suraj Mal, was the most famous of the Bharatpur rulers, ruling at a time of constant upheaval around him. Raja Surajmal used all his power and wealth to a good cause, and built numerous forts and palaces across his kingdom, one of them being the Lohagarh Fort (Iron fort), which was one of the strongest ever built in Indian history. The inaccessible Lohagarh fort could withstand repeated attacks of British forces led by Lord Lake in 1805 when they laid siege for over six weeks. Having lost over 3000 soldiers, the British forces had to retreat and strike a compromise with the Bharatpur ruler. Of the two gates in the fort, one in the north is known as Ashtdhaatu (eight metalled) gate while the one facing the south is called Chowburja (four-pillared) gate. Maharaja Suraj Mal conquered the site of Bharatpur from Khemkaran Sogaria, the son of Rustam, in the year 1733 and established the Bharatpur town in the year 1743. He fortified the city by building a massive wall around the city. He started living in Bharatpur in year 1753. Maharaja Suraj Mal attacked Delhi on May 9, 1753. 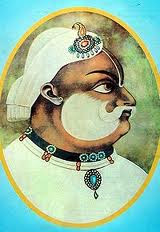 He defeated Nawab of Delhi Ghazi-ud-din (second) on May 10, 1753 and captured Delhi. The Nawab of Delhi, in revenge of the defeat, instigated Marathas to attack Suraj Mal. The Marathas laid siege over the Kumbher fort on January 1, 1754. Suraj Mal fought with bravery and gave strong resistance. The Marathas could not conquer the Kumbher fort. The Marathas were defeated by Afghan armies at the Third Battle of Panipat and a hundred thousand Maratha survivors reached Suraj Mal�s territory while returning south, sans arms, sans clothes and sans food. Maharaja Suraj Mal and Maharani Kishori received them with tender warmth and hospitality, giving free rations to every Maratha solder or camp follower. The wounded were taken care of till they were fit to travel. Thus, Maharaja Suraj Mal spent no less than three million rupees on their sick and wounded guests. Maharaja Suraj Mal died on 25 December 1763 in war with Najib-ud-dola. At the time of his death Maraja Suraj Mal�s Empire included Agra, Dholpur, Mainpuri, Hathras, Aligarh, Etah, Meerut, Rohtak, Faruqnagar, Mewat, Rewari, Gurgaon and Mathura. He was succeeded to the throne by his son, Jawahar Singh. Is it my fault that i m a jat! !